Fox has now released their solution to keeping the rights to the Fantastic Four brand away from Disney. Was it worth the effort? Will the reboot wash the taste of the previous abysmal offerings out of our mouths?? Will comic book aficionados be up in arms at the treatment of the characters??? First off, as fans of the books already know, this incarnation of the team stems from the Ultimate Fantastic Four series, which takes place in an alternate universe and involves a different origin story. The one thing the previous films got right was how the team got their powers (though even that was done in a different manner). Outside of the new origin story, this doesn’t follow any of the comic book storylines … so just know that ahead of time. Whether you care or not is up to you. As for the success of the film itself, I’ll just get my biggest pet peeve out of the way here first. This movie is merely a set up for the next film. It’s like a 100 minute trailer for Fantastic Four 2: The Chronicle of Billy ‘Whiplash-Zoom’ Elliott … Booglaoo. (Took me 30 seconds to come up with that … yeah, I went to college.) It takes well over an hour before the whole team has powers and is in the same room, and there’s really only one fight scene (discounting one minor faceoff between two team members). And without spoiling things, the film basically ends with the team being set up for taking the next step. The next big problem is probably going to be divided right down the line between comic book fans and general audiences. And that’s Dr. Doom. He really is the most significant and most interesting villain for the team so I’m not surprised he’s involved here. However, the adjustment of the character from the iron-fisted ruler of Latveria to a smart kid from Latveria with mad computer skills is rather depressing. I wasn’t as annoyed at the new look as I thought I would be but feel disappointed that the character is more of a science-savvy egotist than a power-hungry despot. I did like that he had no hesitation to kill (and in ways that feel a bit much for PG-13), but liked less the convenience of him being far less lethal when it comes to his approach to fighting the central characters. On the plus side, there’s the casting. Mercifully, Jessica Alba is no longer here to wear blue contacts and dyed blonde hair in a failed effort to portray Susan Storm. And while The Commish (Michael Chiklis) makes for a better Ben Grimm than Jamie Bell, the orange suit from the first two films wouldn’t cut it anymore. Ioan Gruffudd and Chris Evans were actually well cast as Reed Richards and Johnny Storm but Evans is now comfortably running around in a Captain America outfit and if you’re going to reboot, there’s no real way to keep Gruffudd. Instead, we have Miles Teller, Kata Mara, Michael B. Jordan, and the aforementioned Jamie Bell stepping into the team’s shoes. This is where the movie saves itself from being a complete bore and gives the franchise hope for the future. While some fans of the books may also find the younger age of the characters a negative, it at least gives the team a chance to grow as subsequent installments likely come to theaters. And these are actually GOOD actors … what a concept! Now, I don’t have a lot of faith that Fox will completely capitalize on what they have here … I’m the guy who despises the X-Men films for going far too astray from the source material and hasn’t seen any evidence that the studio cares if they get the characters right in that respect. Frankly, I would think most people, comic book fan or not, would rather see Kevin Feige and his team get their hands on these properties. While it would homogenize the look of the Marvel films (a growing problem for them), at least the films would receive the attention to detail and production value they deserve. 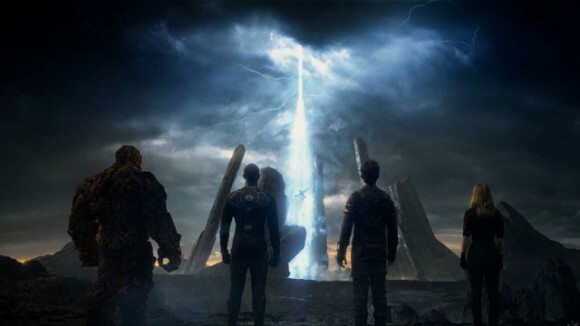 This leads to the next problem for this new Fantastic Four film … the effects. While I understand the hokey look of effects in director Josh Trank’s previous effort, Chronicle, that’s because it was made for next to nothing when it comes to films about people with super powers. While there’s a lot of CGI on display with the Fantastic Four, it all looks about as good as The CW is putting out on television for The Flash (which is good for TV, not so much for films). Many of the effects actually look unfinished and made me feel like I was at a test screening set months ahead of the release date, rather than mere days from the domestic opening. I guess you’re looking for a bottom line here? For me, I think the movie took far too long to get the team up and running with acquisition and control of their powers. Fantastic Four really isn’t so much a movie event but more of a prelude to a potentially good movie event a few years down the line. I will say though that I think the nucleus of something worthwhile has been formed and since Fox has done its job of retaining the rights, hopefully they’ll follow through as they move forward. This may not be a must see, and the effects may look better at home on a smaller screen, but this reboot isn’t the train wreck we’ve seen with previous incarnations of the team. I probably wouldn’t have been happy paying full price for a movie ticket but as a big fan of super hero films, I might not have been so angry at shelling out matinee money. Member of the San Diego Film Critics Society, writing film reviews since 2005. Curmudgeon and lover of Susanne Bier films. Sadly, unlike Candyman, saying my name three times in a mirror does not result in my sudden appearance. However, you'll likely find me wherever a movie is severely melancholy.